Well, I had no idea either. It’s not an award as such. More of a pay it forward to all newbie bloggers, to give them a chance to promote their work. Lovely Elizzibeth over at Elizzibeth gave me a nomination. 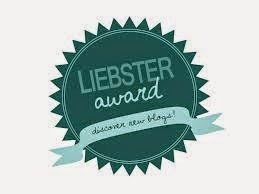 If your blog has under 200 followers the Liebster Award provides an opportunity to tell people why you blog and share your experiences with them. In turn, you ask your nominees to answer some questions you’ve posed to them and the whole thing starts again. Basically, it’s link building between bloggers and introducing the world to new blogs to help them grow their following. 3. After completing the questions you must nominate 11 bloggers with under 200 followers and give them 11 questions of your choice. Vietnam and Cambodia – I love Asian food and the culture. Elizabeth Arden 8h cream – it’s my secret weapon! What is the best achievement you've had since being a blogger? Lennon and Maisie Stella – the two sisters in Nashville who have some great performance videos. Incredibly talented girls. What is your inspiration for starting your blog? Other bloggers. I thought to myself, I could do that too. Now you can’t keep me out of the kitchen. What is your favorite blogger event that you've been to? If you haven't then which one would you like to go to? I haven’t yet been to one. Next year, hopefully I’ll go to Blogger Connect. In September 2013. It was very much a spur of the moment decision. I’ve been hooked ever since. What's the most difficult thing you've had to overcome whilst being a blogger? Losing out on some great PR opportunities, as I’m not yet well enough established with a big enough following. If you had 24 hours to do all of your favorite things to do what would be first? Oooh tough one… Maybe Mr Jones by the Counting Crows or Fast Car by Tracey Chapman. And after a vino or two, I’m partial to Galway Girl… long story. Who has been the most supportive whilst starting your blog? Mr WhatClaireBaked – he eats everything I make without complaint. And some lovely bloggers who've taken the time to read and comment on my posts. Thank you all! 3. Where is the most interesting country you've had readers from? 4. Did anyone inspire you to start your blog? 5. If you could be anywhere in the world right now, where would you be? 6. What’s your ultimate food of choice? 7. What’s been the highlight of blogging so far? 8. What’s your favourite blog out there? 10. What’s been the most successful post on your blog? 11. Where did you last go on holiday? Happy Blogging guys! Keep spreading the word!